Many residents of Metro Vancouver and the Sunshine Coast are waking up to snowfall this morning. 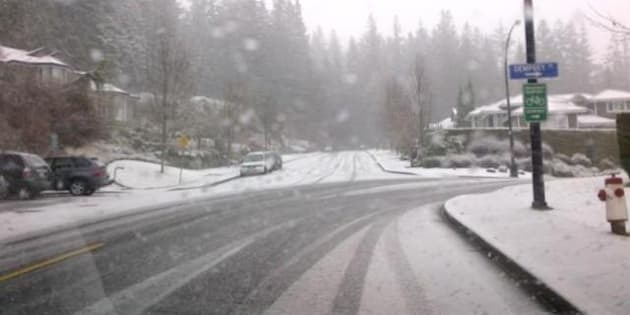 Snow fell overnight in parts of Surrey, Burnaby, Coquitlam and North Vancouver. "Motorists and pedestrians should exercise extreme caution," warned Environment Canada. "Untreated surfaces will be slippery, resulting in treacherous travelling conditions." Mounties in Burnaby warned motorists not to travel until the roads had been cleared of snow, saying it was "better to arrive late than not at all." As of 8 a.m. PT, four local bridges — the Alex Fraser, Pattullo, Queensborough and Iron Workers Memorial — saw heavy delays or had lanes blocked because of the snow. The weather also caused problems for the region's public transportation system. Bus service to Simon Fraser University was suspended until further notice. Reports of ice and packed snow caused delays in bus service in New Westminster, Coquitlam, Port Moody, Port Coquitlam and Surrey. Officials warned SkyTrain was experiencing intermittent delays due to ice buildup on the tracks early Tuesday morning, but the problem seemed to have cleared up by about 8 a.m. PT. More snow was expected to fall in the region Tuesday night. Environment Canada warned a ‘vigorous frontal system’ was expected to bring another round of wintry weather to the South Coast. "Scattered precipitation will persist over the area through today and become widespread this evening as the system approaches," the warning said. "The relatively cold air that is already in place will ensure that much of the precipitation will fall as snow especially over higher elevations." Some areas of Metro Vancouver and the Sunshine Coast were warned to expect up to 15 centimetres of snow b y Wednesday. Email or tweet us your snow photos: @CBCNewsBC.